It’s football season. That means a lot of us will be doing some hard-core snacking. Football helmet full of nacho cheese dip anyone? Anyway, in preparation, I’ve come up with some food hacks for those of you who like to snack but prefer to do it following a live lean philosophy. I’m a big fan of the #slowcarb diet, so I was excited to find some chips and dips that fit with the diet and still taste good. For instance you can’t do corn chips or potato chips on the slow carb diet, but you can have all of the beans you want. 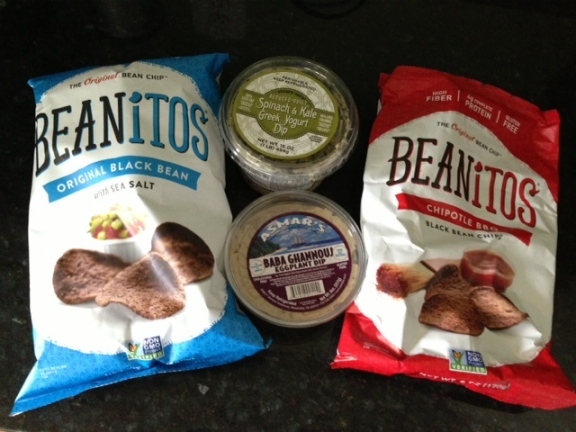 Doug and Dave Foreman came up with Beanitos. These chips are made with nutritious black beans, free of additives, preservatives and corn. Beanitos are also gluten-free, high-fiber, high antioxidant, certified kosher, dolphin safe …etc. etc. Team these bad boys up with some of this crazy spinach or egg plant dip from Trader Joe’s and you are ready to go. It’s like having the top fantasy football quarterback and running back on the same team.